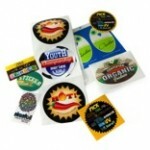 Enhance your packaging and promotions with full color Labels & Stickers that make lasting impression. They are most commonly used as seals and to add basic product information to your merchandise. Our Labels & Stickers pair perfectly with all of our Paper Board Boxes and promotional Point-of-Sale products. Roll Labels are great for a variety of your packaging and promotional needs. They come with a permanent adhesive that sticks well to many different surfaces. Choose from Semi-Gloss, White BOPP or Clear BOPP Roll Labels — all pair perfectly with our paper board boxes. Note that BOPP substrates are oil and water resistant while Semi-Gloss substrates are not. Stickers are a fun way to create memorable marketing campaigns. Printed on premium stocks and liners, our stickers adhere perfectly to most flat surfaces. Intended for indoor use only.